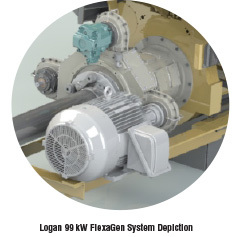 Logan’s new FlexaGen™ is a variable speed motor/generator, typically driven by the main propulsion engines, through Logan’s innovative FlexaDrive™ multi-drive gearbox system. The FlexaGen™is designed to be a standardized power conversion building block that permits operators to select pre-integrated, plug and play units of electrical power for their vessels. FlexaGen™ systems are supplied with all necessary power conversion and control equipment, and can be used to support the vessel’s electrical bus, displace an auxiliary diesel generator, or to power specific consumers directly such as bow-thrusters or cargo handling equipment. With standard configurations of 50KW, 75KW and 100KW available, FlexaGen™ is both scalable, and where required, customizable in both size and configuration. FlexaGen™ delivers cost effective power generation solutions for clients and is suitable either for new build or retrofit projects. FlexaDriveT™/ FlexaGen™ systems are a smart choice for vessel designers as they accommodate the consolidation of multiple functionalities into a single, small footprint, low cost and expandable platform. In addition to motor/generators, FlexaDrive™ PTOs can be added, as required, to power such vessel services as fuel & hydraulic pumps, steering gears, cooling pumps etc. 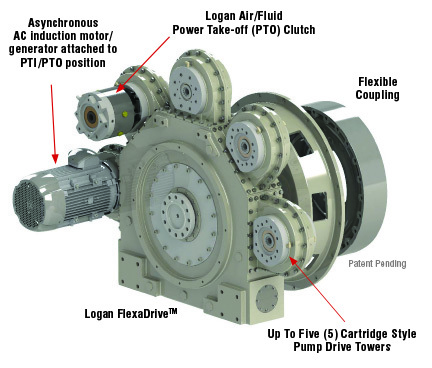 The Logan FlexaDrive: is a multiple pump drive system, sandwiched between your engine and clutch, or transmission; allowing up to ten (10) live PTO / PTI pumps pads for a wide range of hydraulic requirements such as drive shafts, pumps, pulleys, and clutchable power take-offs. 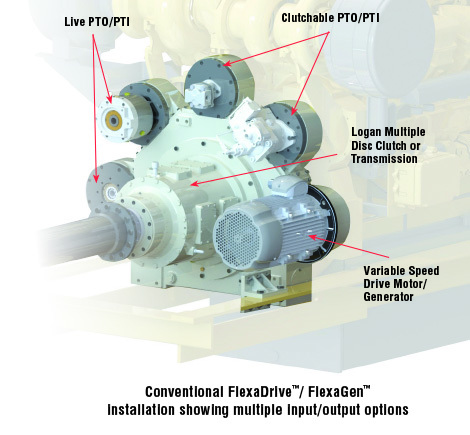 The FlexaDrive™/ FlexaGen™ products can also serve as the platform for a “right-sized”, hybrid propulsion system. The FlexaDrive™ HT (Hybrid Technology) system is a full featured alternative to more expensive systems that are currently being marketed in the marine industry. 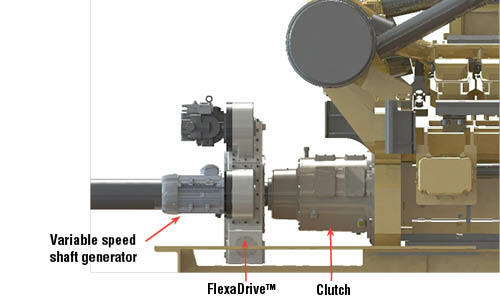 Depending on vessel requirements, the FlexaDrive™ HT system can provide a wide range of operational modes including electric only, diesel electric, mechanical only, bollard boost and more. Imagine a new or repowered vessel where the main engines are able to provide propulsive power AND drive electric generators, bow thrusters, and mission specific equipment – plus provide back-up and redundancy for critical vessel systems. The Logan FlexaDrive and FlexaGen make this possible. Full power control shaft with fractional power take off towers. shaft rpm. The maximum available power developed by this ‘FlexaGen’ ls dependent on shaft rpm, the motor/generator sizing and drive sizing. Ultimately there is a limit of 150kW (at 3000 rpm) for each position on the FlexaDrive. Multiple positions can be used to increase the overall power. 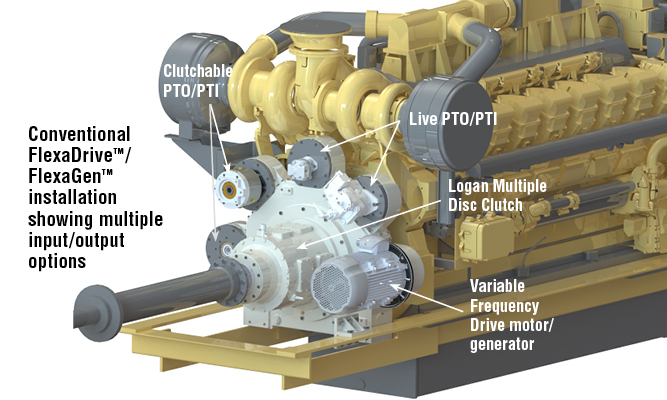 The ‘FlexaGen’ can mimic the properties of a diesel generator and can be configured to run in parallel, sharing load proportionally according to its configuration settings. It can also support the AC bus independently up to its maximum power capability (limited by its own rating and the shaft rpm). 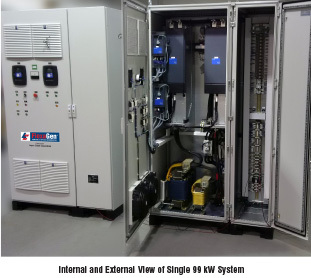 It can be used to mitigate the effects of large step loads on the bus, or to replace a diesel generator connected to the common bus (providing n+1 redundancy), or to make the running of diesel generators unnecessary while the main engine is running. It can also act as a ‘bus saver’ to maintain the bus in the event that other sources (eg diesel gens) fail. Maximum motor speed is 2x full power speed.